An unmanned Progress supply ship loaded with 2.8 tons of equipment and supplies rocketed into orbit Wednesday, chased down the International Space Station and glided to a smooth automated docking after a four-orbit rendezvous. A Soyuz booster carrying the Progress M-22M/P-54 spacecraft lifted off from the Baikonur Cosmodrome in Kazakhstan at 11:23 a.m. EST (GMT-5, 10:23 p.m. local time), roughly the moment Earth's rotation carried the launch complex into the plane of the space station's orbit. The space station passed 260 miles above Kazakhstan within a few minutes of launch, giving the lab's crew a glimpse of the rocket's fiery climb go space. "We got a pretty good view of the first stage," flight engineer Rick Mastracchio told NASA flight controllers in Houston. "After (stage) separation, we pretty much lost it, but it was a good show for a few seconds." The ascent went smoothly and the Progress supply ship slipped into its planned preliminary orbit, with a high point of around 150 miles and a low point of roughly 120 miles, about nine minutes after liftoff. A few moments later, the spacecraft's solar panels and antennas deployed as expected. "We have confirmation of separation of the Progress vehicle (from the Soyuz booster) and also deployment of the solar arrays and the appendages associated with the automated rendezvous and docking system," commentator Kyle Herring reported from NASA's mission control in Houston. In keeping with recent practice, the cargo ship carried out an automated six-hour rendezvous with the space station, docking at the Earth-facing Pirs module at 5:22 p.m. as the two spacecraft sailed high above the Atlantic Ocean east of Florida. The Progress was packed with critical supplies and equipment for the station's six-man crew, including 2,897 pounds of spare parts, experiment hardware and general supplies, 1,764 pounds of propellant, 926 pounds of water and 110 pounds of oxygen. 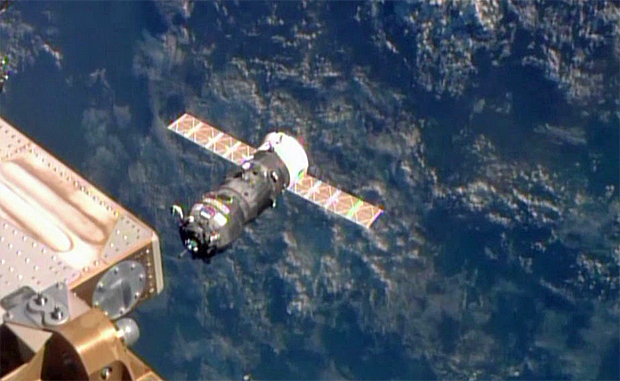 The spacecraft is expected to remain docked to the station through April 7. The next space station resupply mission will be carried out by a commercially developed SpaceX Dragon supply ship launched from Cape Canaveral, Fla. Liftoff is now targeted for March 16.